Another year of fine racing and camaraderie has come to a close with another year of close, hard fought battles, and fierce competition between green and checker. PRO3 again averaged fifteen cars per race, far and away the most popular class in the ICSCC conference. 5th place: Martin Berryman #150 163 points. For the record, co-authors Bill Ecker and Jim Cissell finished 15th with 68 points and 11th with 90 points, respectively. PRO3 cars are also competitive in Group #5 as EIP cars, with PRO3 drivers taking third through fifth places in that hotly contested class. Kudos to Dirk Groeneveld, Nor Coquillard, and John Parkinson. 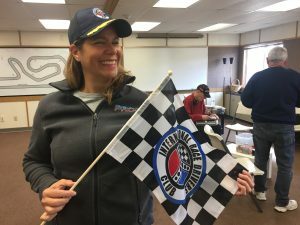 And Daniele Hovington crushed the competition in the ME2 class in the Enduro series (NWMES), followed by her husband Brian, making them the second husband/wife team in Conference history to win individual classes in the same year! Yours truly, Bill Ecker finished third, Jeff McAffer fourth, and Matt Lowell fifth. By the way, that enduro, held at PIR each October, features the longest running LeMans start in all of motorsports! But the biggest trophy of all went to #177 John Parkinson–selected by the License Director as the GB Sterne 2018 Novice Driver of the Year! 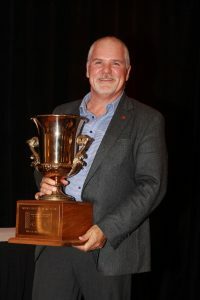 And at the Banquet in November, Conference President Mike Trip gave a special shout out to PRO3. Our entries in multiple classes, despite declining car counts, enabled the Conference to continue operating in the black! Congratulations to all! One final racing note, several PRO3 drivers and former PRO3 drivers now running in Spec E46, again took part in the 25 Hours of Thunderhill, the first week in December. 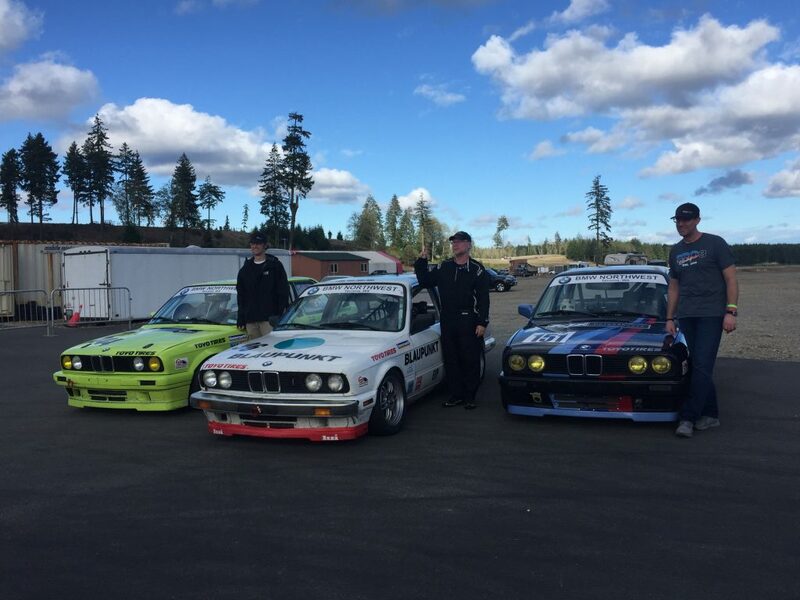 As always, all the PRO3 drivers who entered races were supported by an incredible group of sponsors, including title sponsor BMW Northwest of Fife, Toyo Tires, Bimmerworld, 425 Motorsports, Griots Garage, and AAF (Advanced Auto Fabrication). Thanks to all our sponsors who contributed gift cards, money, or product to sweeten the pot. Sarah Lally Brown and David Weller did a great job filling the monster boots left empty by Lance Richert. Now, for a little history. As a class, PRO3 first appeared in 2002. Unfortunately, ICSCC online records only go back to 2003. Someone posed the question: “How many PRO3 cars are there?”. This prompted a spirited debate on the PRO3 Facebook page, and sent your authors down a rabbit hole in search of an answer. The search led to many people and archives long lost to time. Did you know there was a book of PRO3 in 2008 published by Curtis Creager? Luckily a generous semi-retired racer lent me his copy. The ICSCC records trace the entries and times at the same venues as we still race. Many websites and old PRO3 calendars provided visual records to connect the cars and the drivers to the records. What we learned was this: from 2003 (when there were only three or four cars) to 2018, there have been a total of 101 PRO3 cars built and raced, give or take three or four. This task is made difficult by the inexact record keeping, incomplete memories, a changing scheme for car numbering, different cars running the same number, running the same car with different numbers, and inconsistent car identification across races. The project continues, but as far as we can tell, at end-of-season 2018, there are 79 PRO3 prepped cars sitting in garages, shops and barns ready to race. The average age of the PRO3 cars (as race cars) is seven seasons, with a few cars over 13 years (#75, #71, #105, #117, #136, #27, and of course Lance’s #35). From 2003 to 2017, approximately six cars were added each year, with a big jump in 2012 (eleven) and a little slowing recently (three added in 2017). This year was the first year with fewer PRO3 cars than had raced the year before. Some cars have been retired, like Jim’s Oscar and now Felix, and some have migrated out of Conference racing. One result of the project was prompting some dormant car owners to re-engage. Some cars and drivers that have been in hiding may be back next year! Or, the cars will be for sale. This means that the barrier to going racing in the Pro3 series is a lot easier now and you do not have to build your own car.